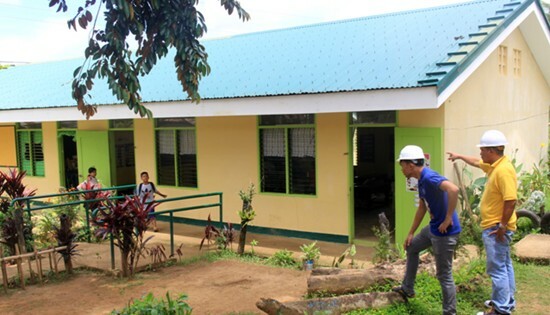 CALBAYOG CITY – The Department of Public Works and Highways Samar First District Engineering Office’ (SFDEO) Public Information Office staff conducts project documentation with the beneficiaries of four school building projects within the jurisdiction of the District on August 3, 2018. The projects documented are Construction of One (1) Storey Two (2) Classroom with toilet Oquendo Central Elementary School, Construction of One (1) Storey Three (3) Classroom (with toilet) Carmen Elementary School, Construction of One (1) Storey Three (3) Classroom with toilet Sinidman Or. Primary School and Construction of One (1) Storey Three (3) Classroom Nijaga Elementary School in Calbayog City. These projects have a combined appropriation of P15,563,196 sourced out from the BEFF CY 2017 fund. Assistant District Engineer Denis C. Cagomoc, head of the District’s Inspectorate Team, leads the recently held inspection of the project, and School Principal Castante accompanies the team during the inspection. The beneficiaries of the aforementioned projects attested to the benefits attained from the fulfillment of the projects. Moreover, they gave their testimony specifying the relevance of the latter towards their daily lives. “In the past few years we have experienced a steady increase in the number of students who enroll at our school. This project comes at an opportune time as it offers a more conducive learning environment,” said Principal Castante. The project documentation with the beneficiaries is a part of Communication Development Program of the Department.